Tokyo, Japan, June 22, 2017 — NEC Corporation (NEC; TSE: 6701) announced today that the 280 kilometer ATISA submarine fiber optic cable system connecting Guam to the Commonwealth of Northern Mariana Islands (CNMI) is complete and operational. ATISA is owned by DOCOMO PACIFIC Inc., a wholly-owned subsidiary of NTT DOCOMO, Inc., who selected NEC, a global leader in the integration of IT and network technologies, to design and build the cable. 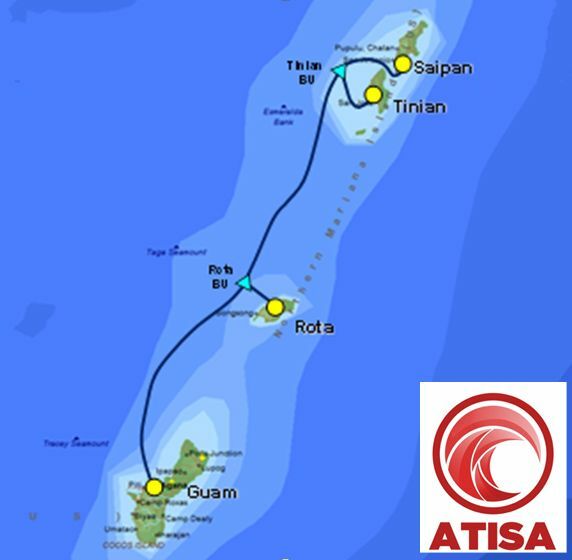 The ATISA submarine cable project (from the Chamorro word atisa, meaning "to illuminate; to accelerate"), which began with the signing of a supply contract in February 2016, was recently brought ashore and connected to the terrestrial fiber networks on Guam, Saipan, Tinian and Rota. The system is now online with an initial operating capacity of 200 Gigabits per second (Gbps) of bandwidth. As presently designed, the total capacity of the ATISA system is 7.2 Terabits per second (Tbps). With the ATISA cable, DOCOMO PACIFIC is providing high-speed internet connectivity services to enterprise customers, including their first enterprise partner, the Commonwealth Port Authority, which operates the Francisco C. Ada Saipan International Airport. ATISA also connects the CNMI to Guam, where local businesses and government agencies can connect to other systems, extending the cable's reach to the global internet. "We are excited to announce that our ATISA submarine cable system is ready for service," said Jonathan Kriegel, DOCOMO PACIFIC's President and CEO. "ATISA makes it possible to offer the people of the CNMI the same world-class products and services already available to our customers in Guam. We look forward to working with enterprise partners of all sizes in the CNMI and helping them to serve their customers faster and more effectively," he added. "We want to sincerely thank our associates, advisers, and suppliers who have worked tirelessly over the last year and half to make ATISA a reality. We would also like to thank the CNMI government agencies, community partners, and especially the people of Rota, Saipan and Tinian for welcoming this project and helping to bring it to completion. ATISA is a major investment in our families and community, and enables us to create ONE Marianas for everyone," said Kriegel. "It is a great honor that NEC has played a part in this significant achievement for the CNMI. I am so happy to share this special and exciting moment with our customers. Since NEC is located in the Asia-Pacific region, we can always provide "real-time" technical support during the operation and maintenance phase as well. I hope that our partnership will be further enhanced, and that we will help develop the CNMI region together, toward deepened mutual understanding and the fulfillment of human potential," said Toru Kawauchi, General Manager, Submarine Network Division, NEC Corporation. NEC has been active in the submarine cable system business for more than 40 years and is now recognized as one of the world's top submarine cable vendors. Including the current construction of the SEA-US cable, the first 100Gbps trans-Pacific cable, NEC has laid a total of more than 250,000 kilometers of cable—the equivalent of six trips around the earth's equator. DOCOMO PACIFIC is the largest provider of quad-play telecommunications and entertainment services in the Marianas. A wholly owned subsidiary of NTT DOCOMO, Japan's leading mobile phone operator, DOCOMO PACIFIC provides award-winning services aimed at transforming your television, mobile, online and home telephone experience. These innovative services include the Marianas' first 100 Mbps online speeds, 4G LTE mobile services, and the new TiVo cable TV platform. DOCOMO PACIFIC is committed to bringing you and your family closer to the things that matter most.